Imagine an intense beam of light that can change colors like a rainbow. Now imagine a diffuse color wash enveloping a room or dance floor in a sea of light, then flashing on and off with pulsating strobe action. Now imagine both of these vivid, yet opposite, spot and wash effects emanating from same compact light fixture . . .and you begin to get a picture of the excitement created by American DJ’s new Fusion Tri FX Bar. Great for DJs, bands and clubs that want to provide a truly unique visual experience, the Fusion Tri FX Bar is a 21.25”/538mm long LED bar that combines two very different and dramatic effects in one light. Effect number one is a hard-edge LED color pinspot -- 4 of them, to be precise. 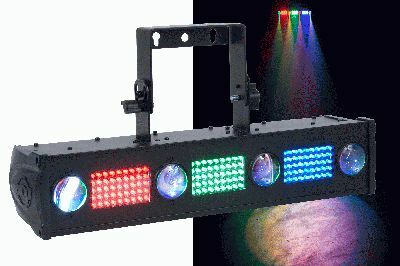 Each of the pinspots is capable of producing 7 colors-- red, green, blue, yellow, purple, cyan and white – thanks to American DJ’s exclusive tri-color LED technology, which allows color-mixing to be done inside each LED light source. Effect number two is an LED wash/strobe effect, created by 3 banks of LED lights positioned between the 4 pinspots. The banks are different colors – red, green and blue – and each is powered by 45 LEDs, for a total of 135 LEDs in this electrifying wash effect, which is capable of strobing in every color. The Fusion Tri FX Bar is the newest member of American DJ’s Fusion Series, which joins or “fuses” different effects onto the same unit to provide end-users with unique lighting looks, along with greater convenience and value. 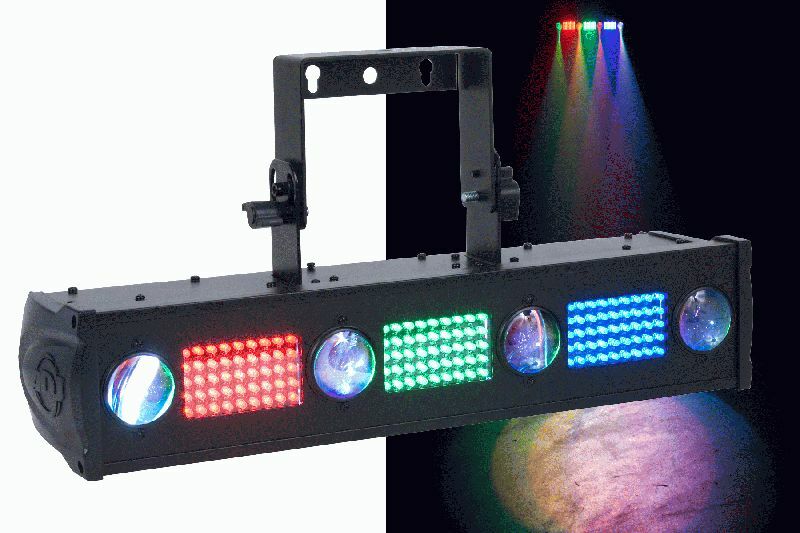 This concept of having more than one type of effect on the same compact fixture has proven very popular with DJs and mobile entertainers, said Scott Davies, General Manager of the American DJ Group of Companies. Like yin and yang, the Fusion Tri FX Bar’s pinspot and wash effects play off each other to form a “whole” -- a perfectly balanced dance of lights. Best of all, this dazzling light show is incredibly easy to put on. Just plug in the Fusion Tri FX Bar, put it in Sound Active Mode, and it will move to the beat of the music via its exciting built-in internal programs. Multiple Fusion Tri FX Bar units can be linked together Master-Slave to light up larger areas. For those who want to customize their light show, the Fusion Tri FX Bar can also be run in DMX Mode from any standard DMX-512 controller. It operates on 8 DMX channels, giving users control over chases, strobing, and the colors of the pinspots and washes. A convenient 4-button LED display menu on the rear of the unit makes it easy to navigate through the settings. The Fusion Tri FX Bar can also be run remotely from American DJ’s optional UC3 controller (sold separately), which allows easy control over its basic functions. Thanks to its LED light sources, the Fusion Tri FX Bar is also easy to maintain and very energy-efficient. Its long-life LEDs have a rating of 50,000 hours, eliminating the hassle and expense of lamp replacement. Despite its high-energy light show, the unit consumes a maximum of only 32 watts of electricity. And with its cool operating temperature, it can run all night -- no on/off duty cycles required. Great for mobile use anywhere, the Fusion Tri FX Bar comes with a convenient mounting bracket and features multi-voltage operation: AC 100V-240V 50/60Hz. Extremely portable, it measures 21.25”L x 5.75”W x 10.5”H/ 538x143x263mm, and weighs 9 lbs./ 3.7 kg. The MSRP of the Fusion Tri FX Bar is $399.95.